1/18: The Boat House Owners Suite on the upper level is just steps away from picturesque West Bay Beach. 3/18: Spacious kitchen with large central island, fully equipped with all your culinary needs. 5/18: Study nook located off the living area. 6/18: Master bedroom with king size bed. 13/18: Master en-suite with shower and double vanity. 14/18: Guest bedroom with two twins. The Boat House-Owners' Suite is the quintessential beach house. There are 2 bedrooms and 2 baths to sleep 4, and a pullout couch to sleep 2 more. Also included is generator power (in case of a power outage) and purified water throughout the home. 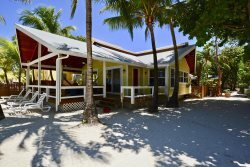 The owner has provided everything you would want or need for your island vacation. As soon as you walk in the door you'll know you are in the Caribbean. There are vaulted ceilings and interior wooden siding throughout. The living room is air conditioned and comfortable with a sofa and two armchairs and a 36" flat screen TV. This flows into the large kitchen, where an island offers seating for 6. Stainless steel GE appliances include a large side-by-side fridge, a 6-burner gas stove, large microwave and dishwasher. Off the kitchen to the front is a covered porch with 2 hammocks. To the side of the kitchen is a dining table with seating for 10. The dining room has jalousie-style windows with screens to enjoy soft breezes while dining, or these can be closed off to use the air conditioning for those hot days. The master bedroom has a king bed with a pillow top mattress and a 24" TV. The en-suite bathroom features a glass-enclosure with rain shower, shower wand and a double vanity. The second bedroom is perfect for kids with 2 twin beds and plenty of space. Both bedrooms have their own AC units. Downstairs is more deck seating and a large gas BBQ grill, and there is an outdoor shower for rinsing yourself and your beach gear. There is an additional unit downstairs with 2 bedrooms and 2 baths. Consider using the whole home if you have a large family or group. Boat House-Owners' Suite is located in the sanctuary of West Bay Village, a cozy collection of 8 Caribbean-style homes located right on West Bay Beach. Each home is private in its own space, yet close enough to your neighbor to make it easy for a quick visit. This area is popular with groups due to this convenient and private arrangement of the homes. There is a beach area that offers all WBV guests beach loungers and a marked swim area. Your team members were helpful in every way. They scheduled pick up and return to the airport, provided transportation to shopping, the zipline and also offered suggestions for tours. REPLY: Thank you very much, we're happy you enjoyed yourselves and hope to have you back soon! The Boathouse exceeded our expectations for comfort, cleanliness and amenities. What an amazing property. The West Bay Village area was beautiful. We always felt safe walking everywhere. Only problem was the hot water issue in the boathouse when we left it still wasnt fixed REPLY: We are very sorry for that inconvenience and you were very understanding about it. It is working well now and we would love to have you back. Additional persons, up to 6 total, may be accommodated for $15/person/night.